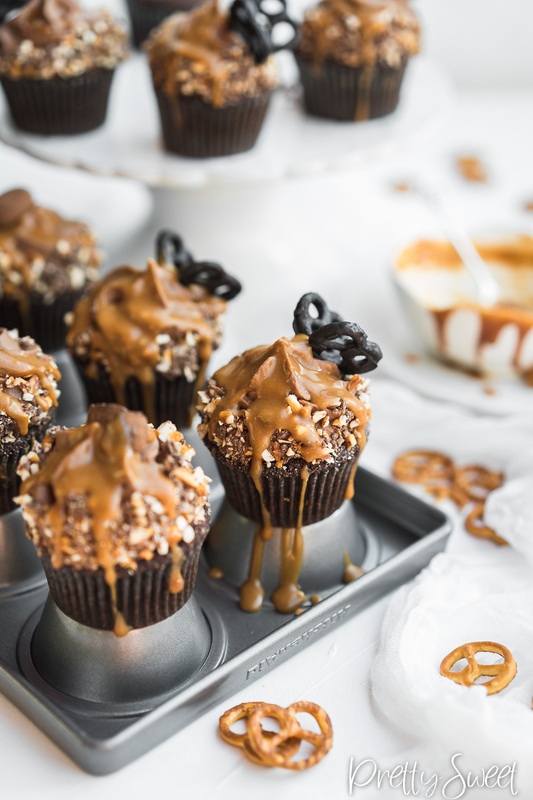 Moist chocolate cupcake, gooey salted caramel filling, whipped caramel milk chocolate, pretzel butterflies and chocolate coated almonds. Does that sound like a dream or what?? 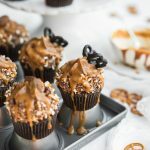 This is everything that makes up these amazing Salted Caramel Chocolate Cupcakes that satisfy any chocolate and caramel lover. 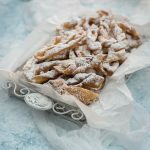 Seriously, if you are into that, you have to make this recipe now! I’m usually one for more fresh or custardy desserts but man does sometimes feel good to indulge in a rich cupcake like this to really satisfy that sweet and chocolate craving. My Chocolate Dream Cake in a Glass also falls under this criteria. There is sour cream in these chocolate cupcakes and that makes them really delicious and moist, also, a good amount of cocoa powder helps. 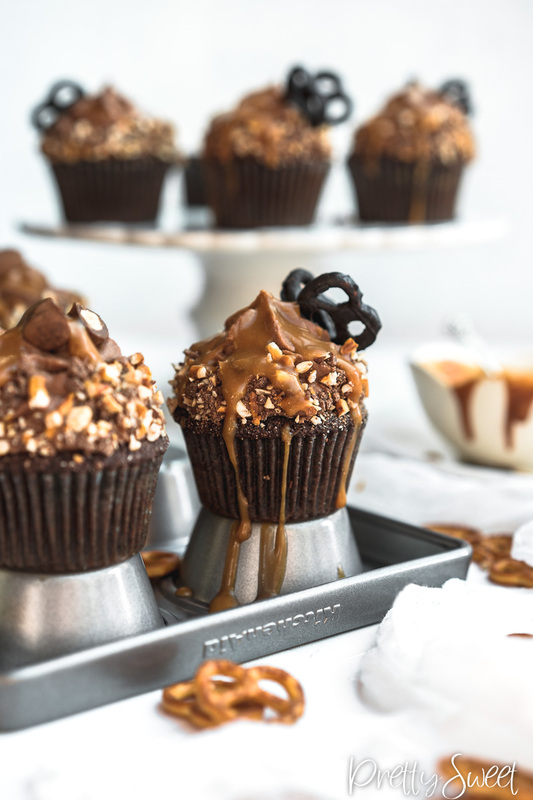 How to ensure that cupcakes come out perfect and moist? Seriously, just like with most cakes/cupcakes, it’s important to not over-mix the batter after the addition of flour so you don’t develop the gluten in the flour and make the cupcakes dry and tough. Over-baking leads to dry cupcakes/cakes/sponges. Check if the cupcakes are done by inserting a toothpick or a clean knife in the center, if it comes out with no wet batter on, it’s done. If you want to prepare the cupcakes in advance and freeze them, do that as soon as the cupcakes cool down. Wrap them in cling film and close them in a ziplock bag or something that won’t let the odors of the freezer affect the cupcakes. Oh, salted caramel. I always thought I don’t like caramel until I discovered home-made caramel. Now it’s dangerous for me to be around it! That deep, rich caramel flavor to which we add salt to make the flavor even more complex, it’s addicting. a toffee method in which you just dump everything in the pan at once (sugar, cream, and butter). 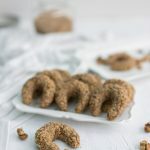 I plan to do a comparison between them in a different post but for this recipe, but we will be making the dry method for this recipe which is the fastest, and there’s less of a chance of it crystallizing which can happen sometimes. I’ll go more in detail about that in the caramel post but if that happens to you now, refer to this video. If you’ve never made salted caramel at home, just follow the recipe and it should come out good. Use most of it for the filling and the rest for drizzling. Before drizzling, heat it a bit so it becomes more loose and better for drizzling. Caramel can be made a few days ahead and stored in an airtight container in the fridge or freezer. Whipped ganache, have you made it before? If you did, you know how awesome it is. If you didn’t, you should make it and see how awesome it is! I really dislike buttercream okay? There are so many better and more flavorful alternatives to it, I don’t get why you would use it for anything else than frosting a cake and making pretty flowers and decorations with it. 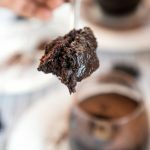 Whipped ganache is such an awesome alternative and so easy to make. Literally, combine the cream and chocolate, leave to cool and whip, done! You’ve got yourself a light, delicious frosting. I used a high quality, organic, fair trade milk almond caramel sea salt chocolate from Chocolates from heaven. It is so good and has caramelized almond bits inside, yum! God, I love quality chocolate. You can really tell a difference in the mouthfeel and flavor of the chocolate. If you can’t find that one, try to get another milk chocolate with salted caramel or use your favorite milk chocolate. 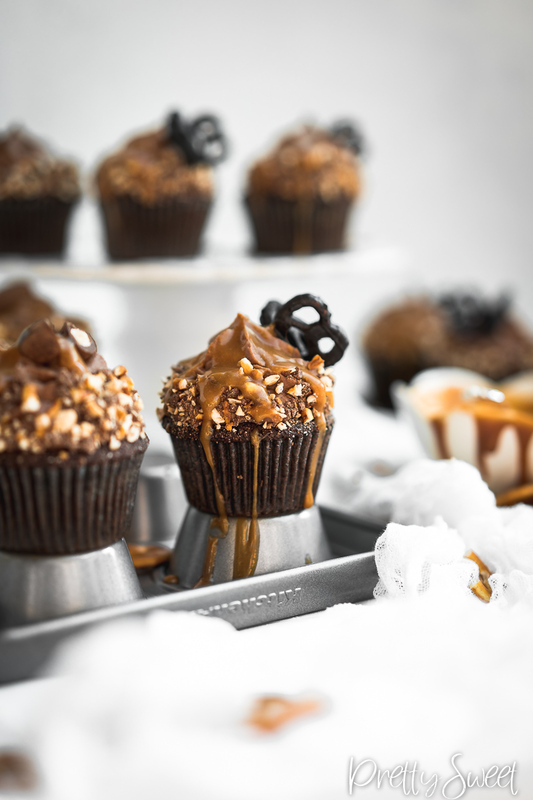 The whipped ganache ratio we are using is 1 part cream to 1.5 part chocolate to get a really light frosting because salted caramel chocolate cupcakes can quickly be too heavy and sweet, right? And one really important thing to be careful when whipping the ganache is to not over-mix it! You know how a whipped cream can get curdled and separates if you mix it too much? Well, the same happens to the whipped ganache, so whip it just until it holds its shape enough to be piped, around 2-3 minutes on medium-high speed. Don’t they make such a cute decoration? But don’t think they are only there for that. 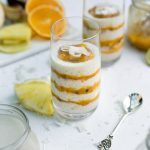 I always try really hard to add decorations that are not only pretty to look at but they add something else to the dessert and also be an integral part that shouldn’t be skipped. And in this case, it’s the crunchiness and saltiness of the pretzels. It plays with the whole cupcake so well. To make them you will have to temper the chocolate, dark or semisweet. If you don’t know how to do that, check this video. Dip 2 pretzels in the chocolate and place them together at an angle, so they touch in the middle to make a butterfly shape when the chocolate hardens. Have something to support them while the chocolate is setting. 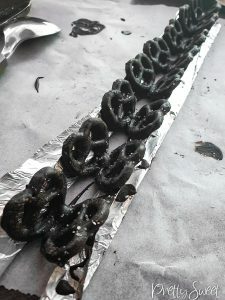 I made a simple shape from foil to hold them as you can see on the picture. Additional: sprinkle them with sea salt before the chocolate sets. 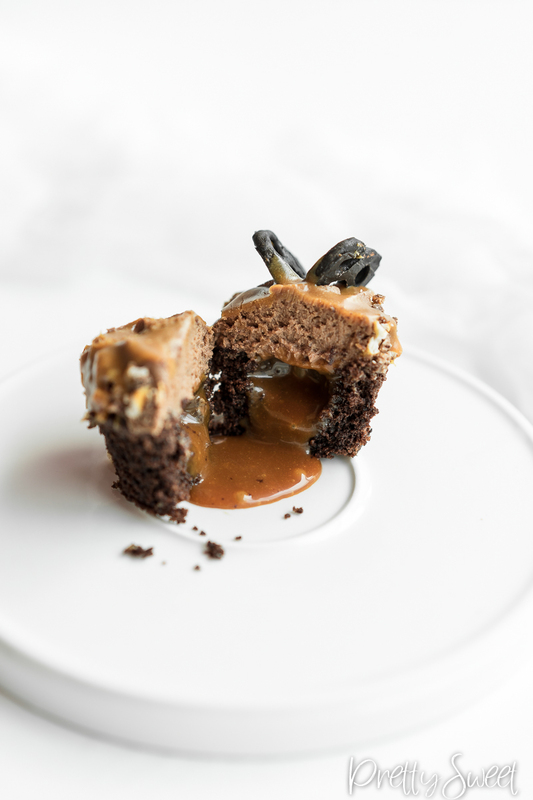 “What if I am too lazy to do the chocolate butterflies and only want to eat the salted caramel chocolate cupcakes,” you ask? 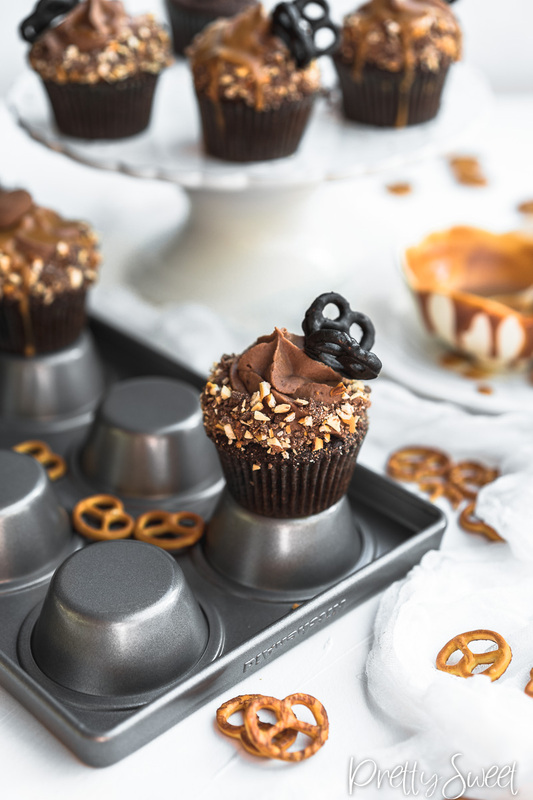 Then I suggest just breaking the pretzels to pieces and use them on your cupcakes additional to the crushed ones around the bottom frosting part. And because you are a cupcake lover, I’m sure you would also love my amazing fresh Mojito Cupcakes. 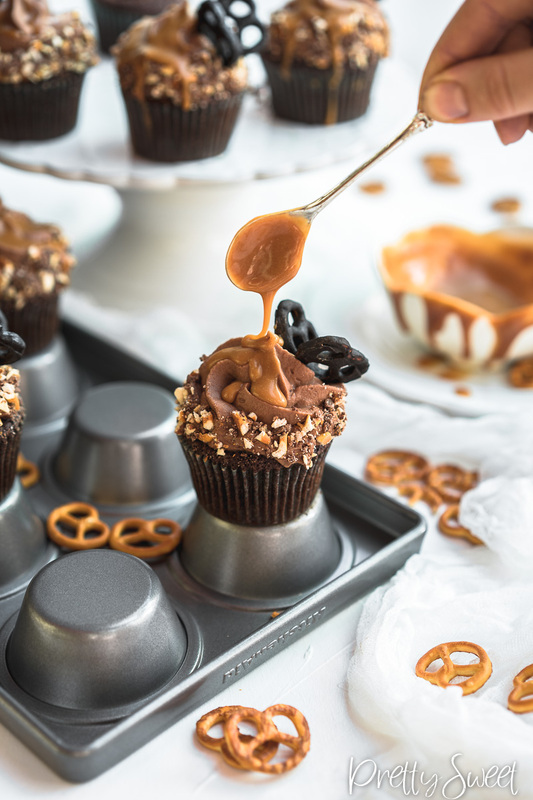 And now that you are super prepared to make these salted caramel chocolate cupcakes with chocolate butterfly pretzels here is the recipe. Make it in the given order. Heat the cream to a simmer and pour over the chocolate that you broke into small pieces. Leave for a minute then whisk until you get a homogeneous and shiny ganache. Mix in the butter, leave to cool to room temperature, cover with cling film and place in the fridge. 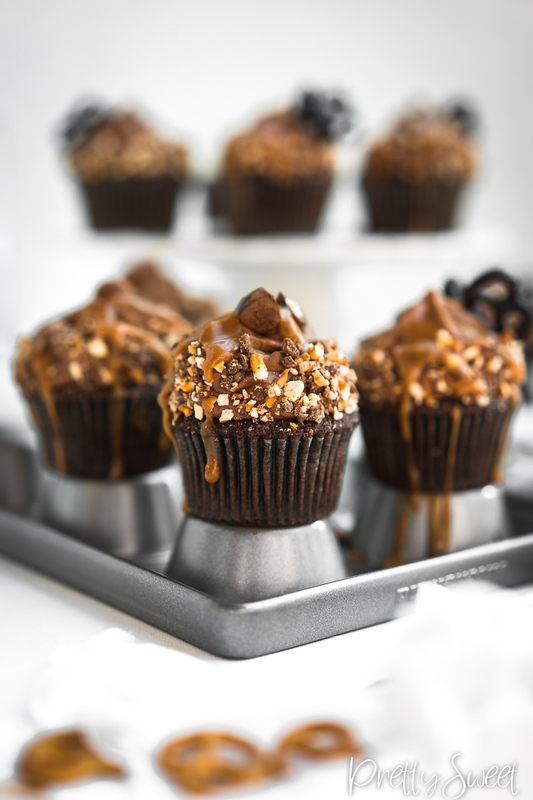 Meanwhile, make the salted caramel and chocolate cupcakes. Weigh the cream and set aside. Place half of the sugar in a wide and tall heavy bottom pan and heat it on medium heat. Leave to caramelize undisturbed as long as possible. When you see the caramelization getting too dark on one place start to stir the sugar with a metal whisk to distribute everything evenly. When about half of the sugar is caramelized, add the other half of the sugar and let it slowly turn into caramel, stir when needed and don’t go away while making the caramel. As soon as the sugar all melts, remove the pan from the heat and add in the caramel while whisking vigorously. Be careful to not touch the sugar or splash it around as it is very hot. Stir the caramel until you have a homogenous mixture. If there are caramel bits on the whisk that have to be melted place it back on the heat just to melt it. Mix in the butter, vanilla and salt. Transfer to a bowl where you can blend it with an immersion blender. Try not to add the air in while blending. Leave to cool. Preheat the oven to 180°C and line the muffin tray with 10 cupcake liners. Beat the butter and the sugar until light and fluffy on medium-high speed, about 4 minutes. Add in the egg, beat for another minute. Combine the flour, baking soda, baking powder and salt. Mix half of the flour mixture in the butter, add the sour cream, combine, and then briefly mix in the second half of the flour mixture just until everything is combined. Don’t over-mix. Distribute the batter to the cupcake liners and bake for about 17-20 minutes. Check if they are done by inserting a toothpick or a clean knife in the center, if it comes out with no wet batter on, it’s done. Check the instructions for chocolate pretzel butterflies in the text before the recipe, if you are making them. Roughly chop a handful of pretzels and the chocolate coated almonds. Separate and set aside 1/4 of the caramel sauce for the drizzle. Take the cooled ganache and whip it on medium-high speed for about 2-3 minutes until it holds its shape enough to be piped. Be careful to not over-mix. 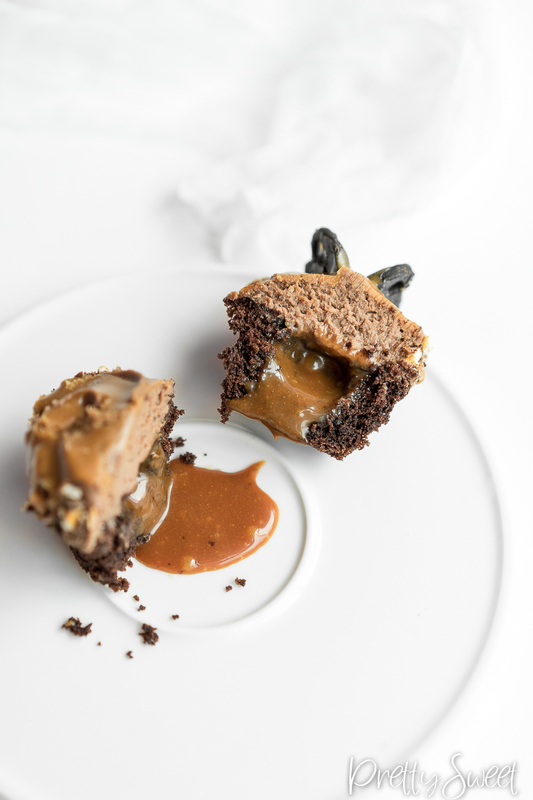 Place the whipped ganache in a piping bag with a star nozzle tip. Core the center of the cupcakes and fill them with salted caramel sauce. Pipe the whipped ganache on top. Take the chopped pretzels and almonds and stick them around the bottom part of the frosting. Place a chocolate pretzel butterfly on top. Heat up the leftover caramel and drizzle it on top of the cupcakes. 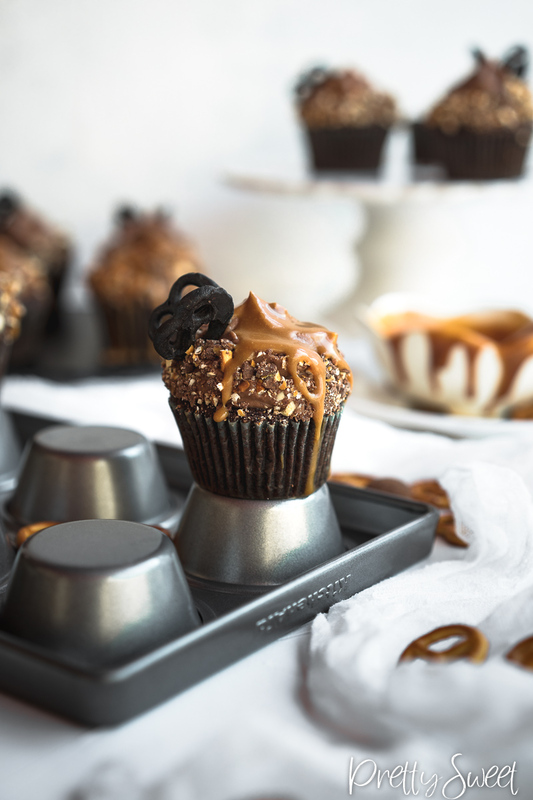 Now enjoy you rich, indulgent salted caramel chocolate cupcakes! 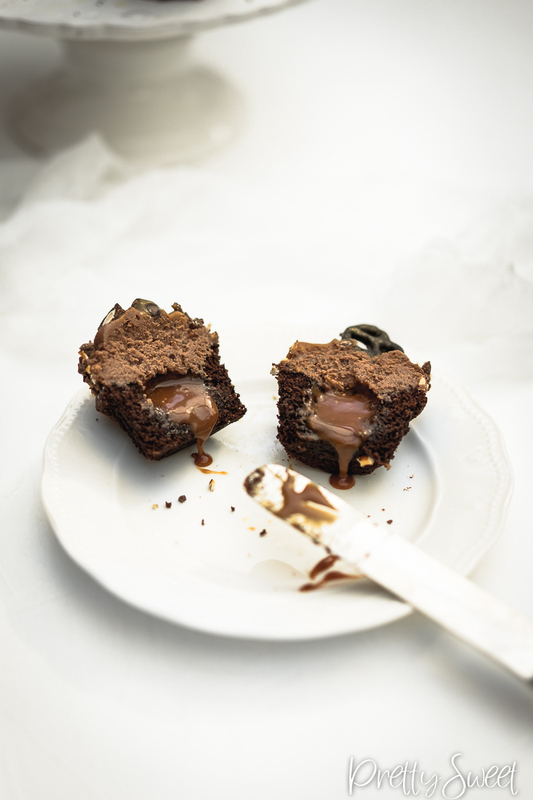 If you can’t get the Chocolate from heaven chocolate, use other caramel milk chocolate or milk chocolate. Use as much caramel as you want in the filling and on top. Cut the holes in the cupcakes accordingly. Caramel can be made ahead and stored in an airtight container. Use as much salt as you want in the caramel, if you prefer it more salty use more than the given amount. 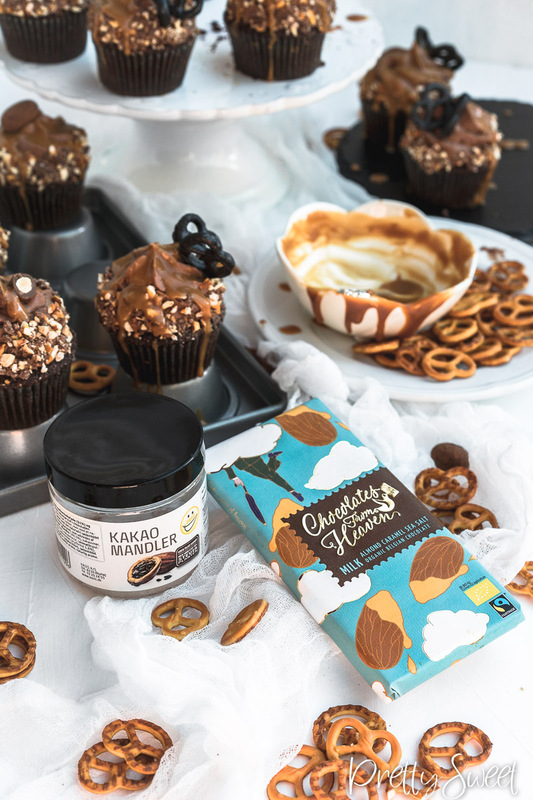 If you don’t want to make the chocolate butterflies, just use more pretzels for decoration. 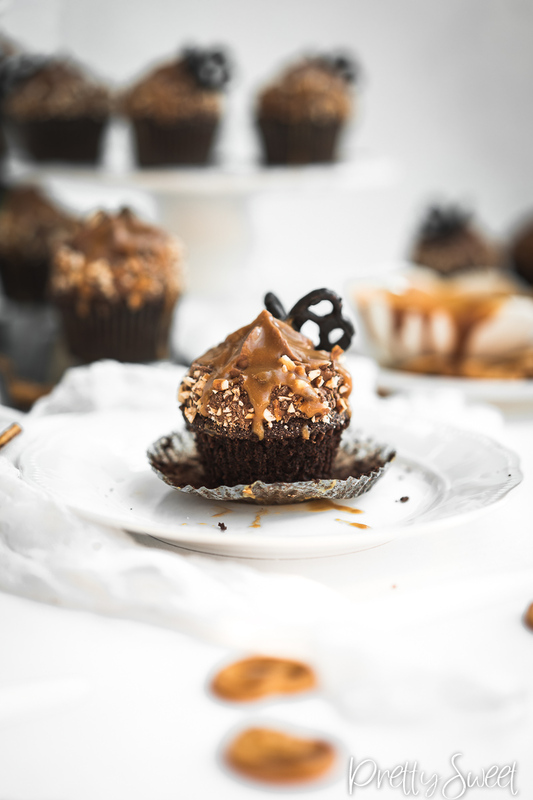 Chocolate cupcakes can be made ahead and stored in a ziplock bag placed in the freezer. 3 months max. 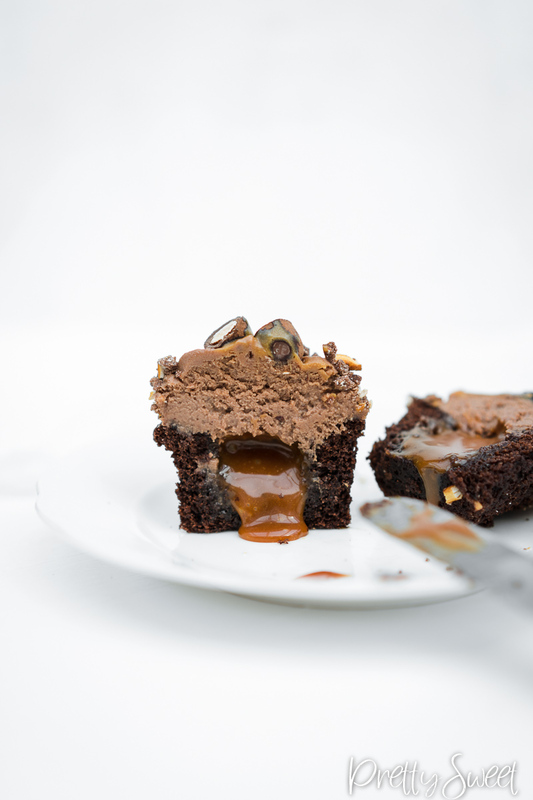 Assembled salted caramel chocolate cupcakes are best eaten fresh. Store them in an airtight container for 3 days.